A while back, I asked the folks at IMS ExpertServices whether they had in their archives any papers regarding typical fees charged by expert witnesses based on experience, success rate, professional bona fides, type of legal case, etc. They responded saying that in fact there was a series of white papers being prepared intended to educate both current and prospective experts on requirements and expectation for their service, as well as what range of fees can be charged. The first two papers have been published as of this writing. A brief synopsis of each is presented below. It is worth remembering when considering getting involved in the expert testimony world that the people you work for and against are all capable lawyers, so as the old sports saw goes, "Your best defense is a good offense;" i.e., be prepared and capable of delivering on promises or someone's going to come after you >:). Ted Gorder is an accomplished professional services executive with more than 30 years of experience creating and running global consulting practices. He has been responsible for developing consulting practices for firms such as Siemens, Ernst & Young, and NCR. In these roles he focused on defining, selling, and delivering complex solutions to Fortune 1000 companies around the globe. As a co-founder of IMS ExpertServices, Ted is responsible for operations and administration. His focus is on operational excellence, quality control, and service to both clients and experts. First in the "What to Expect When You're an Expert" series is a paper titled, "Admissibility of Expert Testimony ," written by Wendy N. Pearson of Pearson Research Group. If you follow the expert witness field at all, then you are familiar with 'Daubert,' which, for the uninitiated, has nothing to do with Scott Adams' Dilbert and his maniacal dog Dogbert. Rather, it is a much-followed standard of admissibility for 'expert' testimony. Winners love it; losers hate it, but everyone has to live with it; therefore, it is imperative that you, as an expert, understand its implications. "You may be the expert in your field, but if you fail to understand how the rules on admissibility of expert testimony may affect your opinions and testimony, you jeopardize your role as an expert. If the court excludes your testimony, all your hard work is for naught and you lose your opportunity to be the expert in front of the jury. This series presents strategies on how to conduct business with an eye toward the rules on the admissibility of expert testimony (Rule 702 of Federal Rules of Evidence; Daubert, Frye, or state variations) throughout the litigation process. The information contained in these chapters has broad application to all experts – regardless of discipline – because all experts should keep Rule 702 and Daubert principles (or the applicable equivalent in the governing jurisdiction) in mind when considering retention for a case and when actually working on a case." 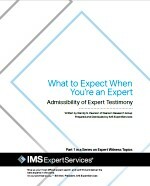 This white paper may be downloaded from the IMS ExpertServices website (click the thumbnail above). 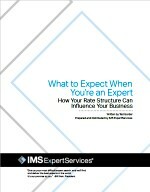 Next in the series, and the topic in which I expressed interest, was written by IMS ExpertServices co-founder Ted Gorder, titled, "How Your Rate Structure Can Influence Your Business." Within he covers Hourly vs. Fixed Fee, Scope Creep (we in the electronics design realm refer analogously to 'feature creep'), Testimony, Day Rates, Travel, Blended Team Rates, Contingent Fees, Retainers, and various other areas of focus. "IMS ExpertServices has been providing expert witness services for more than 15 years. We have placed more than 3,000 experts in support of a variety of civil actions. This experience has given us unique perspective on the ways experts charge for their services. We have seen how attorneys respond to rate structures, fee levels, and contract complexities. This is a summary of what works and what does not." IMS Expert Services is the premier expert witness search firm in the legal industry, focused exclusively on providing custom expert witness searches to attorneys. To read this and other legal industry Expert Library publications, please visit IMS Expert Services' recent articles. For your next expert witness search, call us at 877-838-8464 or visit our website.